A Quick And Easy Way To Make Kelp And Zucchini Pad Thai. Some times you really just miss those old standby meals. I used to be a huge fan of pad Thai take out. Little did I know that what I was eating was a far cry from healthy. This will be incredibly healthy kelp and zucchini pad thai. The “take out” version of pad Thai is nearly always packed with inflammatory oils, MSG, and almost all the nutrients had been cooked out of the food… leaving me feeling like I needed a nap instead of like I had just eaten. This recipe is a superstar variation that satisfies my Pad Thai Cravings and takes even less time than my old carry out. 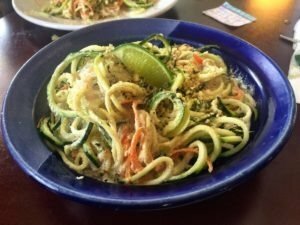 It features kelp noodles which are a dense source of fiber and minerals as well as Spiralized Zucchini Noodles which are packed with phytonutrients. All of ingredients have anti-cancer properties. Feel free to be adventurous with the toppings, the more veggies and colors the more healing power this meal will pack! Start by mixing the dressing in a small bowl, set aside letting the flavors develop. Spiralize the zucchini to create “noodles”. Prepare any chosen toppings. Rinse your kelp noodles under cool purified water and strain. Add kelp and zucchini noodles to a large bowl, add dressing and hemp seeds and mix gently until well coated. Serve garnished with scallions and other desired toppings.